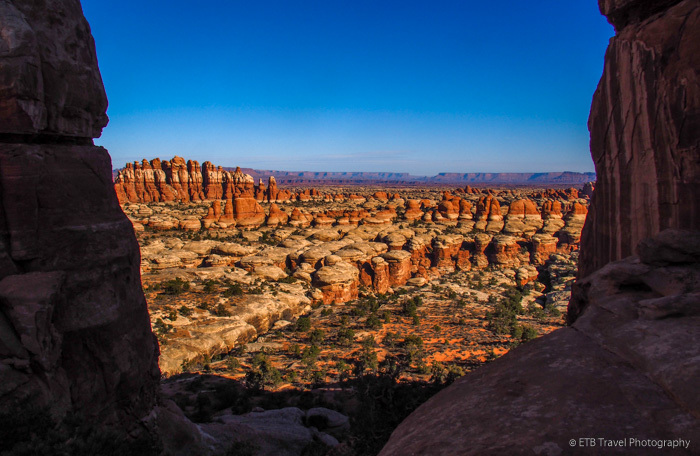 Located just 40 miles from the entrance of the Canyonland’s Needles District, Monticello is a great base for hikers wishing to explore some iconic trails. It also serves as a great base for historians and geologists, as the area is pepper with Indian ruins and unique rock formations. Monticello was settled by members of the Church of Latter-day Saints in the 1890’s. Monticello is the second most populous town with approximately 2,000 residents in San Juan County. It grew between the 1940’s to 1960’s during the Uranium boom. Well there really isn’t any better deal than Blue Mountain Horsehead Inn. Forty dollars buys a super friendly check in service, a clean room, bed and cable. I didn’t need any more than this on my night passing through Monticello. Just down the road from Blue Mountain Horsehead Inn is Doug’s Steak & BBQ. The brisket and Au gratin potatoes are spectacular! The Frontier Museum is housed in a historic barn in downtown Monticello. The free museum features exhibits including 20th Century clothing, area minerals, old electronics, and Indian artifacts. It’s worth a stop to get a feel for the area. Church Rock is a solitary column of sandstone on the eastern side of Hwy 191 about 14 miles north of Monticello near the turnoff to the Needles Districts. It seldom earns more than a glance, but there is a 1930’s myth that tells how it got its name. The story goes that Marie Ogden and her spiritual following settled nearby and planned to hollow out the rock by hand for a church. In fact, the rancher who owns the property dynamited a storage area in the rock in the 1940’s for his cattle’s salt licks and feed. Between Church Rock and the Needles, only 25 miles from Monticello is Newspaper Rock State Historic Monument. Newspaper Rock is one of the largest known collection of petroglyphs. There are over 650 rock carvings of animals, human figures and symbols. Some are around 2,000 years old. Monticello is the closest town (52 miles) to the Needles District of the Canyonlands. The Needles is named for its colorful spires of Cedar Mesa Sandstone. The area is less busy than the popular Island in the Sky section of the park near Moab. The needles district offers every level of trail from short and easy to long and difficult. Some short hikes include Roadside Ruin, Cave Spring, Pothole Point and Slick Rock. A strenuous trail, due to its length and requirement to scramble in places, Chesler Park Loop. These are just a few suggestions. There are plenty of options. The Butler Wash Indian Ruins are only 40 miles southwest of Monticello. The overlook to see the Butler Wash Indian Ruin is located at the end of a half-mile trail. It is worth the short walk past junipers and pinyon. The canyon’s edge offers spectacular views of the extensive ruins. The cliff dwellings were built by the Anasazi’s 700 years ago. They include four kivas, storage areas, and underground ceremonial rooms. 100 feet above the canyon floor and several feet below the rim, I couldn’t help but wonder how the Anasazi established a community in this location. I found these cliff dwellings mesmerizing. The Mule Canyon Ruin will be located just off the highway. This commercialized area is easily accessible to any traveler. The ruin is covered and interpretive signs explain its history.